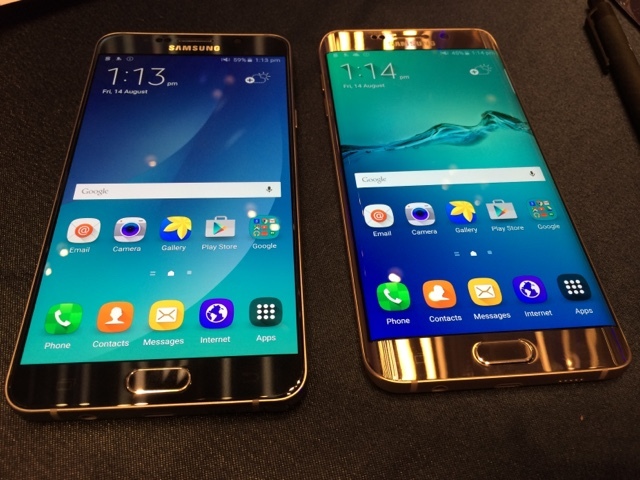 There are two main reasons why you should get on the phablet train: the Samsung Galaxy Note5 and Galaxy S6 edge+. With many brands taking Samsung's lead - now also offering large screen devices - it’s not only a question of whether you should choose to go big – but it’s also about knowing which device offers fearless innovations that truly fit your lifestyle best. The introduction of the Samsung Galaxy S6 and S6 edge earlier this year created an unmatched stylish footprint that blurred the line between fashion and technology. The leading-edge innovation of the world’s first dual-edge display, and the perfect balance of contrasting glass and metal materials married design and functionality so well. What Samsung created were smartphones designed to reflect an exquisite eye for design – making them stylish statements for their users. Now the Samsung Galaxy S6 edge+, with its 5.7” screen, has the distinction of offering the world’s biggest dual edge display. With more screen real estate, watching movies or playing games becomes a truly immersive multimedia experience - coupled with UHQ (Ultra High Quality) audio upscaling also introduced in the latest flagship phablets. Its curved screen also offers unparalleled accessibility and functionality with the introduction of Apps Edge which gives easy access to your favourite apps, and People Edge that supports easy, personalized communication with your preferred contacts. The Samsung Galaxy Note5, on the other hand, is the 5th iteration of the smartphone that single-handedly created the phablet segment, comfortably anchored on its heritage of being a powerful productivity device. In the course of its evolution, it now leaps into more stylish, but no less functional, territory. Its well crafted glass and metal body now offers a more ergonomic grip, thanks to its narrower bezel and curved back. But its indispensability lies in its hallmark feature, the enhanced S-Pen, which has been engineered to help people get more done, faster. It now feels so much more solid, offering improved writing and precision capabilities, and a variety of practical tools. With the Off-Screen Memo, users can quickly jot down ideas or information using the S-Pen even while the screen is off. Users can now more easily annotate PDFs, capture lengthy web articles or long images via the new Screen Write. Even the Action Memo introduced way back in the Galaxy Note 3 is now made more intuitive in linking writing to actions. Of course, next level design is not the be all and end all of Samsung’s flagship phablets—a fact that the brand takes to heart as it continues its innovative legacy. Their devices are packed with remarkably distinct core features that answer smartphone users’ core needs -- the best display, the most advanced camera, longer battery life, and faster charging – even without wires. Both the Samsung Galaxy Note5 and Galaxy S6 edge+ have a 5.7-inch Quad HD Super AMOLED display with sharp, crisp and an all around stunning multimedia viewing experience. In multi-tasking, the powerful 64-bit Exynos Octa-core processor with 14nm technology and 4GB of RAM housed inside its carefully crafted aluminium chassis means a smoother, seamless user-experience. Having the best display, the most advanced camera, and a full suite of productivity features would be for naught if your smartphone’s battery life could not keep up with your lifestyle’s needs. That will never be a problem as Samsung powers both the Galaxy Note5 and S6 edge+ with 3,000mAh of battery power, supported by Adaptive Fast Charging (wired), and built-in Fast Wireless Charging capability. For times when you need to be on-the-go, you can get up to 4 hours of battery life in just a 10-minute charge. You can also get a 100% charge in 90 minutes using the Adaptive Fast Charger (up to 2.5x faster than other brands), or 100% charge in 120minutes using the Fast Wireless Charger (~33% faster than the previous Samsung Wireless Charger). If you’re out without your charger, you can always rely on Samsung’s Ultra Power Saving Mode to extend your battery to its limits, and still be able to receive and take calls, SMS, access the internet, and select apps. 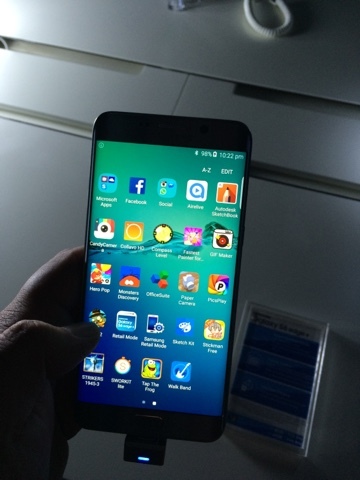 All that said, the distinction between each phablet also splits into its unique core capabilities: the Samsung Galaxy S6 edge+ being the top choice for those who lead multimedia-savvy and fast-paced lifestyles, and the Galaxy Note5 being that for productivity-seeking users who want to be able to do and achieve more. Bottom-line? You can’t go wrong with either—but it will all depend on what your lifestyle demands from your smartphone. The choice ultimately comes down to which Samsung phablet fits you. And whichever Samsung Galaxy phablet you choose, rest assured that that you’re giving yourself, quite literally, a massive upgrade in terms of style and functionality that no other brand can deliver -- no hype here, just the real deal.